"For this satisfying dish, cabbage leaves are stuffed with a seasoned mixture of rice, ground beef, pork and ham. They are then laid on a bed of sauerkraut and simmered to completion. This is the best stuffed cabbage recipe I've ever tried." In a large bowl, combine the beef, pork, ham, rice, onion, egg, garlic powder, salt and pepper. Mix well. Form meat mixture into oblong balls, using 1/2 cup of the mixture at a time. Then, wrap a cabbage leaf around each ball. I love Sarma we make sarmas a lot at home and Dolma's, I made the Turkish way, similar recipe but I like the Turkish way better. Great eastern european sarma recipe!! Thank you. I changed it a bit by leaving out the ham and adding a kilbasa to the pot as it cooked. Came out wonderful. 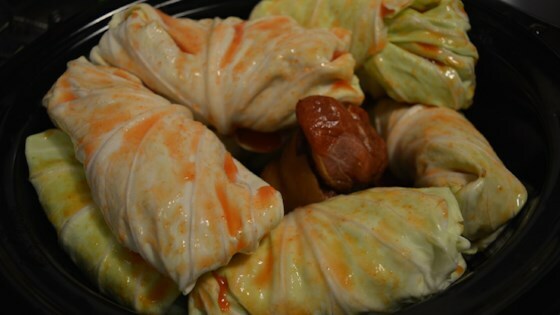 This sarma is called sarmale,and it is made mostly in Romania. This ethnic recipe is awesome! I just used ground beef and put ham hocks in the slow cooker! I didn't add the tomato! The key thing is to improvise! But, the slow cooker is a miracle!